It was a good harvest, looking set to continue for a few more weeks. The freezer was full, as were those of friends and family. Roadside signs brought in some trade, but there was still much more surplus to requirements. Such a shame to waste it, even fallers from the apple tree were snapped up when left in bags on the dogwalk. Inspiration struck, and loading up the car we headed to a local tearooms. Homemade jams and chutneys were for sale, so we offered a trade. Our surplus fruit and veg for a cream tea once a week. 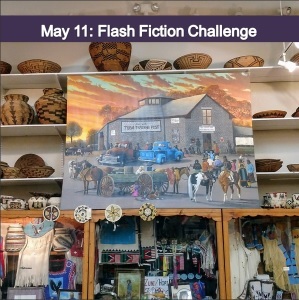 This entry was posted in #flash fiction, blogging, Challenge and tagged #flash fiction. Bookmark the permalink. Sounds fair to me…well done Di..
Oh it was, and we did very well. We even got a jar of chutney made from our own beans and green tomatoes at Christmas! This kind of trade is my favorite. We bartered for and with many things grown in north Idaho. Weekly cream tea sounds good! What is cream tea? It sounds good, but I don’t know what it is. The trade and barter system seems to give lots of room for building community. A better time gone by, perhaps. A cream tea consists of a fruit scone, jam and clotted cream served with a pot of tea. Sometimes butter is included with the scone. It is very indulgent and calorie loaded! Bartering was an old means of trade in years gone by.